When I review wines sent to me or at a tasting room, I really prefer not to see the tasting notes provided by the winery. It’s pretty hard to turn a blind eye…but I do try. 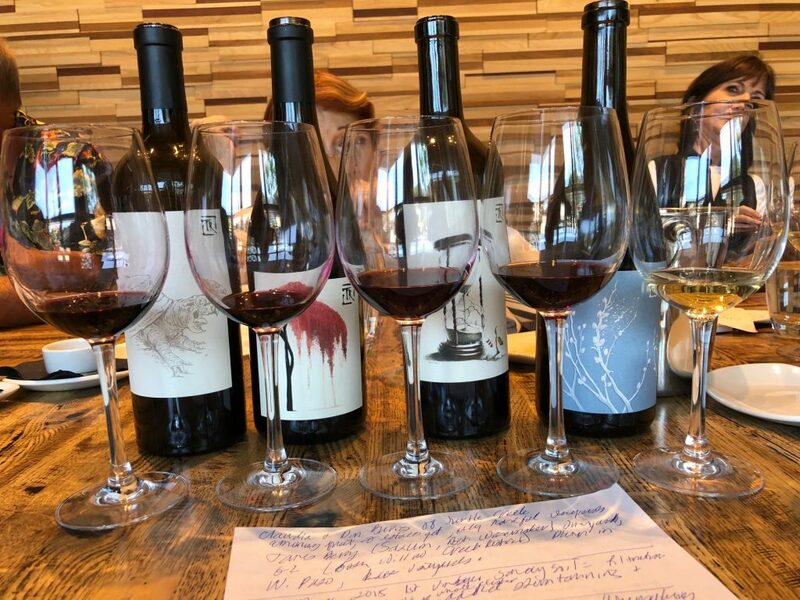 In this tasting I haven’t looked at the tasting notes that were emailed to me, but I include them below so that you can compare their notes to mine, and for the pairings they offered. Also, truth be told, after all these years doing this I’m always tickled if and when some of our notes match up. Observations: Opaque, the color of deep garnet with a dark edge. Aroma: Raspberry, black currant, dark cherry, bell pepper, balanced. Observations: Opaque, blackberry color, brown edge. Aroma: Stewed fruit, plums, earth, suede, coffee, tobacco, red licorice, black pepper. Wine collectors around the world have mastered the allure and prestige of the esteemed appellations of Bordeaux – and this season, you can join them. 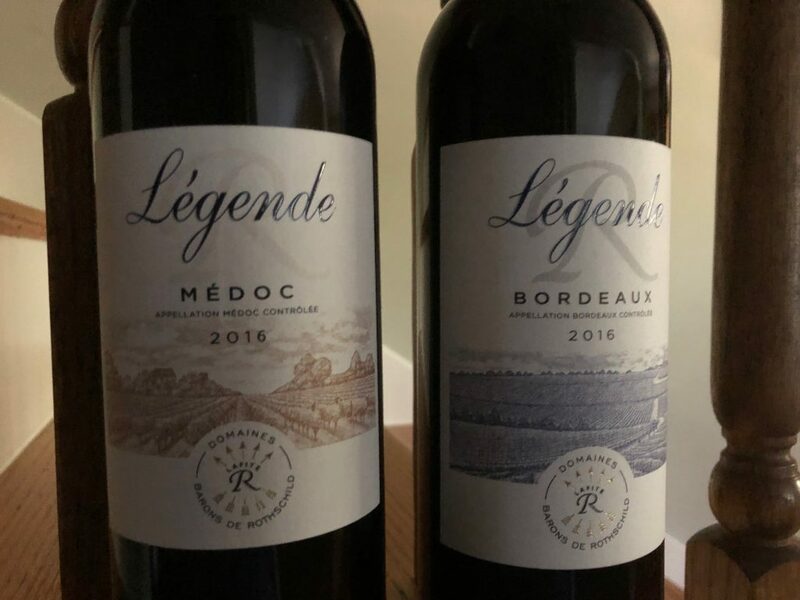 With the Légende wines collection, self-proclaimed connoisseurs now have access to wines from one of the region’s top producers – Domaines Barons de Rothschild (Lafite). All wines in the collection perfectly capture the spirit of the iconic region through the lens of one its most influential producers. Paired with savory fall dishes, or on its own with a good book – you will certainly find your favorite Bordeaux in the mix. Légende Bordeaux Rouge 2016 – $17.99 – Pair With Apple Picking! A wine for every day, dinner with friends, or a glass in front of the fire, Légende Bordeaux Rouge is a well-balanced blend of traditional grape varieties. The Cabernet Sauvignon gives the wine the classic elegance of the Lafite style, while the aging gives it charm and a well-rounded character. On the palate, the wine is structured, round and easy, nicely oaked with firm, silky tannins, and a long, fresh and fruity finish. Légende Médoc 2016 – $24.99 – Pair With Fresh Winter Flavors! The rich patchwork of châteaux in the Médoc produces ruby-colored, well-rounded wines that are a fine accompaniment to many fall dishes. The Légende Médoc benefits from the same care as a Grand Vin: rigorous selection, extreme precision in the winery, with meticulous specifications, reduced yields, impeccable ripeness, purity of fruit, and traditional maturing. The star of the Médoc, Cabernet Sauvignon is given excellent expression and can be appreciated for its natural characteristics by lovers of Bordeaux’s wines. The wine is generous and silky, with a full-bodied, very rounded structure. The finish is long and spicy. 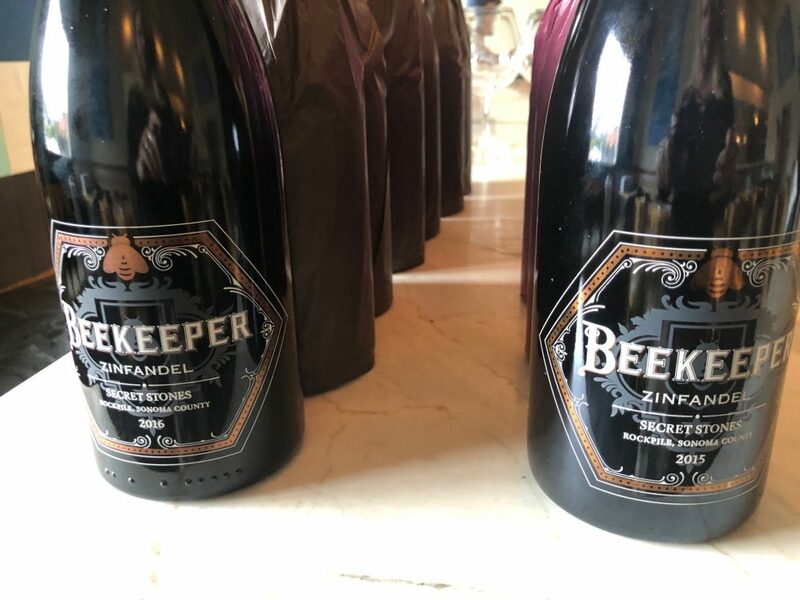 This is your opportunity to taste some of Beekeeper Cellars greatest wines, including our all-new 2015 Montecillo Vineyard Zinfandel…alongside their 2016 Secret Stones and Montecillo. Their 10th harvest is the 2018, which Ian believes will be an incredible vintage. Ian found himself on a Napa trip, travelling as the group’s chef, and discovered some “cool…great vintages…slept at Robert Mondavi’s house, met Joseph Phelps…” and it was a turning point for him. He started his wine business soon after. All of the wines spend time in 100% French oak, no American oak. They purchased an exceptional sorting table – no raisins get through. His secret ingredient in some of his Zinfandels is a percentage of Petite Sirah. For his Rockpile Zinfandels it can be anywhere between 4 and 20 percent. Why the name Beekeeper? Ian’s great-grandparents were entertainers, not the desired immigrants to the U.S. at the time, so they said they were beekeepers. 2011 Rockpile – Rich, velvety, black fruit, chocolate; black cherry, spice, great balance. The first wine to sample and already a favorite. 2012 Rockpile – Bright, cigar, oak, blueberry; dry, tannic, dark fruit. Eddie’s first favorite. 2012 Black Sears – Dried berries, char, leather; red to blue fruit tannic, long finish. 2014 Montecillo – Rich, cherry cola, green peppercorn; spice right up fruit, thickly layered fruit. Our second favorite so far. 2015 Montecillo – Balanced, blue to black fruit, black licorice; dark fruit, cigar tannin. 2016 Montecillo – Red cherry, stems, green brush; round, tart, dry, lingering black fruit. Found our third favorite with this one. 2015 Rockpile “Secret Stones” – A bit of Petite Sirah and more time in oak for this Zinfandel, and it proved to be our fourth and top favorite in the tasting. I’m a sucker for wines where the aromas are so different from the flavors: stewed fruit, muddy earth, prune; lovely slightly sweet fruit balanced perfectly with black pepper, making the wine seem older than a 2016 for me. 2016 Rockpile “Secret Stones” – This wine was just released: tart cherry, fresh, cigar; dry, tart, but also quite earthy. 2016 Rockpile Hidden Hillside Reserve – A blend from both Rockpile and Montecillo, Zinfandel and Petite Sirah, not sent in for critic reviews. Strong dark fruit, wet leaves; dry fruit, tannic, long finish. NEW YORK (PRWEB) – Leading wine & spirits importer Palm Bay International is pleased to announce the addition of Calvados Boulard’s V.S.O.P. Bourbon Cask Finish to the current Spirit France portfolio, which includes Calvados Boulard X.O., Calvados Boulard V.S.O.P. and Boulard Auguste X.O. Calvados Boulard is a renowned fifth-generation company, producing the most exported Calvados in the world. Calvados Boulard V.S.O.P. Bourbon Cask Finish is a very limited release with 500 cases available globally, half of which are allocated to the US market. The V.S.O.P. Bourbon Cask Finish is the first expression in Boulard’s new 12 Barrel Collection, showcasing innovation in the spirit’s finish. Calvados Boulard’s V.S.O.P. Bourbon Cask Finish is bottled at 88 proof and includes the bottle number and signature of the cellar master, Richard Prével, on the front label. Calvados Boulard V.S.O.P. is the result of blending different Calvados Pays d’Auge aged at a minimum of 4 years. Calvados Boulard V.S.O.P Bourbon Cask Finish is aged in oak casks for the necessary time to obtain the perfect blend, and then rested in Bourbon casks. The finished spirit has an attractive, buttery bouquet with nuances of smoke and vanilla notes, reminiscent of crème brûlée. This limited-edition expression reveals a generous and complex palate, with layers of honey, baked apple and maple syrup. To produce the full, signature profile of the product line, Boulard selects 30-40 varieties of apples from the existing 120 varieties in Pays d’Auge. Calvados Boulard uses only cider apples, from the four major families: bitter for structure, balance and harmony; sweet for richness in sugar; bittersweet for tannins; and slightly acidic for freshness. Double distillation consists of two successive heating stages over direct flame: the first gives the “petite eau” and the second, the “bonne chauffe.” A slow and meticulous maturing process starts in oak casks, resulting in a golden and amber color. Calvados Boulard’s V.S.O.P. Bourbon Cask Finish is rolling out nationwide at a suggested retail price of $55 (750 ml). The spirit is best enjoyed neat or in a classic cocktail like a Calvados Manhattan or Old Fashioned. The international renown of Maison Boulard owes its origins to the inspiration of Pierre-Auguste Boulard, the founder of the prestigious Pays d’Auge distillery in 1825. Since the days of Pierre-Auguste, five generations of the Boulard family have contributed to the development of this family business, which has gone on to become an international company. With a presence in every single country in Europe and a distribution network covering 80 countries over 5 continents, Calvados Boulard is the number 1 exporter of Calvados in the world. For more information, visit http://www.calvados-boulard.com. Palm Bay International, a Taub Family Company, has spent the past forty plus years curating one of the most admired portfolios of imported wines and spirits from key appellations/origins around the world, including a growing range of domestic wines. Collaborating almost exclusively with family-owned wine estates and distilleries, Palm Bay has developed a flourishing portfolio that meets the needs of every level of trade. Among Palm Bay’s most valued assets is its remarkable network of long-term partnerships with our suppliers and with the foremost wholesale companies, as well as our own team of passionate, dedicated professionals. Through three generations of bold leadership and a commitment to authenticity and craftsmanship, Palm Bay International has solidified its reputation as a major source of fine wines and spirits and industry leader in the U.S. marketplace. For more information visit http://www.palmbay.com. In only about 150 pages author Adam Centamore covers “The Basics” of tasting and pairing cheese (and condiments) with every wine imaginable – sparkling, white, red and dessert – in his book, Tasting Wine and Cheese. Don’t skip the compelling forward to this book written by Dr. Diran Apelian. (Professor, Mechanical Engineering and president of the International Wine and Food Society) who was vital in getting Centamore to pen this book. Centamore cajoles readers to pay attention “beyond what we need to form a basic judgment” to get the most of what we eat and drink. This is a common lament of mine as well. On page 17 we are reminded that temperature effects aroma (a too-cold wine is often closed) and how this also relates to getting more aromas from foods that are warm as opposed to cold. Pages 21-25 are devoted to observing the look, the smell, the feel and the flavor of cheese, which gives the reader a very good start before settling in to pair. 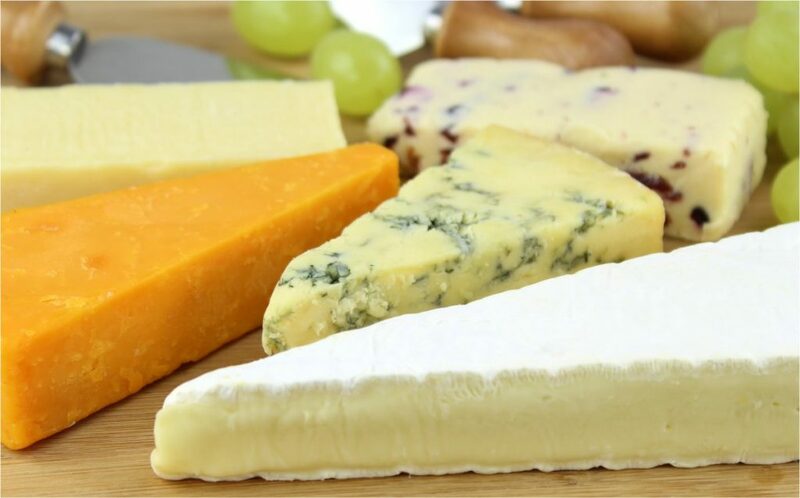 By page 30 Centamore gives us some pairing examples, how terroir (what the goat grazed on) applies to cheese as it does wine and how combinations of foods are better together than as stand alones. We then learn how tannin and fat – fat in steaks and tannin in red wines – balance each other out. Not to give too much away, after a little pairing education, Centamore moves into pairing every wine varietal – common and uncommon – with different cheeses. From the sparkling start though to sweet red wines, he lays out different pairings, however, if there was a common theme I did note that French cheeses were often suggested with French wines, Spanish was the same, and so on. Much like pairing wine with any food, I often reach for what the wine was meant to be served with. The book concludes with a neat little chapter on condiments, as adding them to your cheese and wine pairing is a way to “add another flavor or texture.” Here is where you will pull out your jams and fruit chutneys, chocolate and dried fruit, honey, nuts, vegetables and herbs. If you have a fave wine or a fave cheese, the index will come in very handy as well. In his gorgeous new book, Tasting Wine and Cheese, Maître d’Fromage Adam Centamore teaches readers how to first taste wines and cheeses separately, helping everyone to understand the complex profiles of reds, whites, aged, and fresh. But wading through these waters is only half the battle. Tasting Wine and Cheese takes readers on a journey through pairings of cheeses with white, red, sparkling, and dessert wines. There is even a section to help reader’s pair condiments with their wine and cheese. Whether readers are looking to broaden their appreciation for gourmet combinations or simply looking for a menu to host a party, everyone will find everything they need in this comprehensive, must-have guide. “Wine and cheese pairings decoded! In Tasting Wine and Cheese, Adam employs the same approach in this book as he does his classes – comprehensive, fun and filled with practical information for anyone interested in the enjoyment of food. The result is a pairing of its own as both a solid primer and a worthwhile reference for your future wine and cheese pairing adventures.” – Tim Bucciarelli – Manager, Formaggio Kitchen. LOS ANGELES (PRWEB) – Cooper’s Hawk Winery & Restaurants, the lifestyle brand centered around wine and food, focused on creating memorable moments that enrich lives, has expanded its role as the Official Wine of the Screen Actors Guild Awards® to salute the 25th Annual SAG Awards. At the heart of the Cooper’s Hawk’s celebration is a wine named the “Artist’s Red Blend” developed under the supervision of Cooper’s Hawk CEO/Founder Tim McEnery and Winemaker Rob Warren to salute the SAG Awards’ Silver Anniversary. This limited-edition wine, which bears a commemorative label, will be served during the Awards ceremony on Sunday, Jan. 27, 2019. This event will be simulcast live at 8 p.m. (ET) on TNT and TBS. Cooper’s Hawk’s “Artist’s Red Blend” will also be the Official Wine being served at the Post-Awards Gala that same evening. In addition, Cooper’s Hawk will be offering this exclusive wine in its restaurants during live viewing parties on Jan. 27, and it will be available to the nearly 350,000 members of the Cooper’s Hawk Wine Club as January’s wine of the month. This marks the second in a multi-year partnership between Cooper’s Hawk and the SAG Awards. The critically acclaimed winery also returned for its second year as a partner of the SAG-AFTRA Foundation’s Patron of the Artists Awards, held on Nov. 8, and provided wine for the receptions. Cooper’s Hawk Winery & Restaurants will provide exclusive taste experiences throughout the evening of the SAG Awards. Honorees, presenters, industry notables and members of SAG-AFTRA at the SAG Awards ceremony and Post-Awards Gala will be served Cooper’s Hawk Artist’s Blend. The individual components of this deep red blend come together in a synergistic way; much like the characters in a movie, to form something that is more than the sum of its parts. The nose is loaded with aromas of blackberry, cherry, plum, vanilla, and baking spices. It is full-bodied with firm, well-rounded tannins and an exceptionally long finish. Cooper’s Hawk wines have earned more than 500 awards, including Best of Show at the prestigious 2017 San Francisco Chronicle Wine Competition. In addition to its winery, the company operates 34 restaurants/tasting rooms and the country’s largest members-only Wine Club. 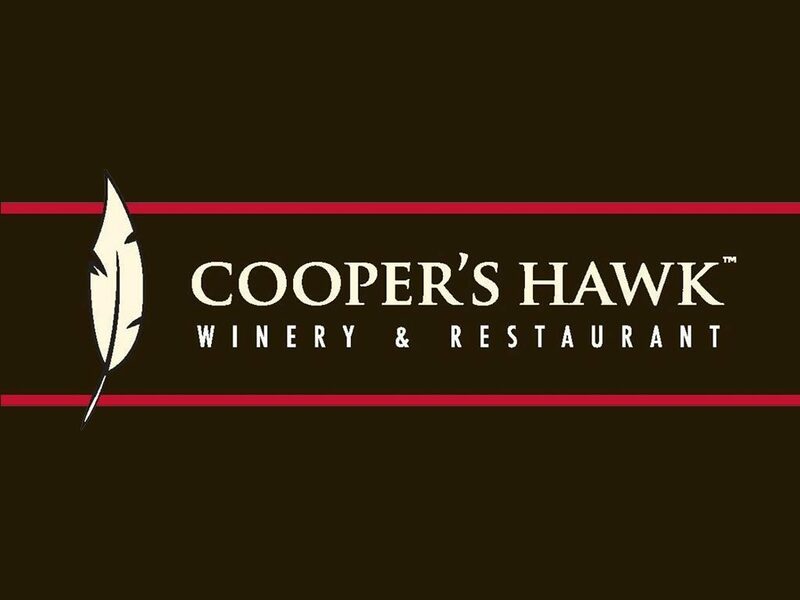 Founded in 2005 by CEO Tim McEnery, Cooper’s Hawk Winery & Restaurants is built upon the passionate belief that food and wine hold the power to forge lasting connections. Cooper’s Hawk is a lifestyle brand centered around wine and food and focused on enriching lives. The concept is a fusion of familiar elements – winery, modern casual restaurant, Napa-style tasting room and artisanal retail market – that has combined to create an entirely new hospitality experience. The 25th Annual Screen Actors Guild Awards, presented by SAG-AFTRA with Screen Actors Guild Awards, LLC will be produced by Avalon Harbor Entertainment, Inc. and nationally simulcast live on TNT and TBS on Sunday, Jan. 27, 2019 at 8 p.m. (ET) / 5 p.m. (PT). Nominations will be announced on Wednesday, Dec. 12, 2018. One of the awards season’s premier events, the SAG Awards® annually celebrates the outstanding motion pictures and television performances from the previous calendar year. Of the top industry honors presented to actors, only the SAG Awards are selected entirely by performers’ more than 160,000 peers in SAG-AFTRA. The SAG Awards was the first televised awards show to acknowledge the work of union members and the first to present awards to motion picture casts and television ensembles. For more information about the SAG Awards®, SAG-AFTRA, TNT and TBS, visit sagawards.org/about. Alessio, one of Sicily’s most iconic winemakers, will share a first look at the full range of wines from his family’s new estate on Mt. Etna. These high altitude, volcanic vineyards are yielding some of Italy’s most exciting wines, marked by minerality, finesse and elegance. Read more about Planeta’s new Feudo di Mezzo estate here: http://www.planeta.it/en/territori/etna-feudo-di-mezzo/. The culinary team at Terroni West Hollywood will design a casual, Sicilian-inspired menu to match Planeta’s Etna wines, which will include a traditional method sparkling wine, indigenous whites made from Carricante, and reds from Nerello Mascalese. Metodo Classico Brut NV, 100% Carricante – Cheddar cheese, cream and mown grass; lemon, pear, medium acid worked well as a palate cleanser with the grilled shrimp. 89 Eve pts. Etna Bianco DOC 2014, 100% Carricante – Yellow cling peaches, Meyer lemon, candied ginger; lemon-lime, peach, medium tartness and a low acid that was very refreshing with the fried calamari (with a squirt of lemon). 90 Eve pts. Eruzione 1612 Carricante 2014, 90% Carricante, 10% Riesling – Sprite soda, pink grapefruit, apricot and other stone fruits, cream; lots of pear, followed by lemon zest and white pepper. 90 Eve pts. Eruzione 1612 Carricante 2011, 95% Carricante, 5% Riesling – Strange to smell black licorice but very, very pleasant, then came juniper, dried vanilla bean, creamy vanilla ice cream and orange; steely, grass, juicy Mandarin orange, cucumber (I pictured it cut in a bowl before I recognized the flavor – wham!) and ginger. 95 Eve pts. Etna Rosso DOC 2014, 100% Nerello Mascalese – Cherry, stems (indicative of a Pinot Noir) and then a blast of blackberry; tart, dusty and bright at the same time, young, dry. 88 Eve pts. Eruzione 1614 Nerello Mascalese 2013, 100% Nerello Mascalese – Cherry, Italian plums, warm concrete; tart cherry, grape skins, green peppercorn. 88 Eve pts. Eruzione 1614 Nerello Mascalese 2011, 100% Nerello Mascalese – Aromatic rose petal, sandalwood, peppered chocolate; more Burgundy-like than domestic Pinot Noir-like, the terroir showed with dry tannins, more fruit and a dazzling long finish. 91 Eve pts. A couple of thoughts struck me as I went through the above tasting. One was that the two grape varietals were ones I was unfamiliar with, and the other was that their flavor profiles were familiar. In asking winemaker Alessio Planeta more about this I was happy to see that I was on the right track. First I learned that both of the grape varietals, Carricante and Nerello Mascalese, are only grown in Etna, Sicily. The white wine grape, Carricante, reminded me of a Spanish Albariño, while the Nerello Mascalese was similar in taste profile to an earthy Pinot Noir. 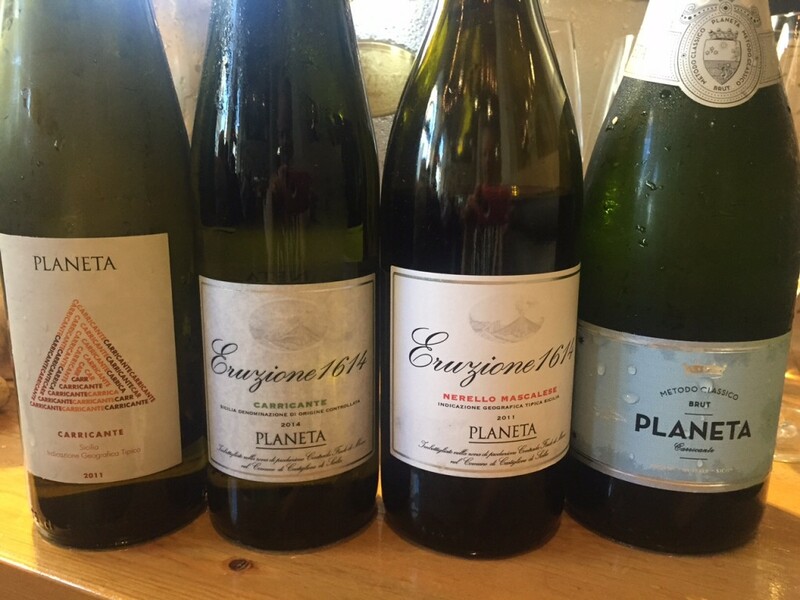 Planeta agreed with my findings, on both counts though he noted more minerality and Riesling qualities to the Carricante. I agreed with him then, especially with the Carricante wines that had been blended with Riesling grapes. The wines with some age on them were remarkably more developed on both the nose and in the mouth. All were very pleasant as a whole, and worth looking for. Mount Etna covers an area of approximately 460 square kilometers, which makes it the largest active volcano in Europe, and is the third most active in the world. The surrounding area is an ancient and charming wine-growing zone, which has seen few substantial changes since the days of the ancient Greeks who some 25 centuries ago described it in their legends. After years of research, Planeta has identified three extraordinary sites. The first is Sciara Nuova, 870 meters above sea level, in the municipality of Castiglione di Sicilia where, due to the altitude, the first grapevines planted were mainly white grapes. At the moment there are about 6 hectares and a fine old winery that will be transformed into an excellent place to receive guests. Then there is Montelaguardia. Running alongside the Circumetnea railway, there is a small valley of about 10 hectares. 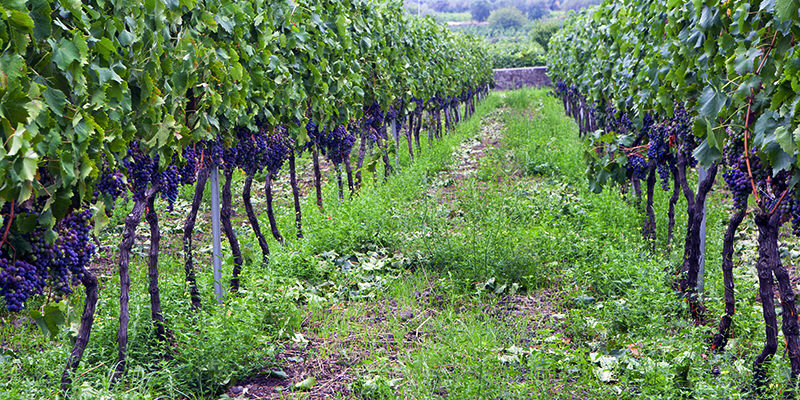 Its soil is perfect to bring out the best from grapes grown on the volcano. Finally there is Feudo di Mezzo, in a central position compared to the other vineyards. It will host the wine cellar. The ambitious architectural project sees it – once again – perfectly integrated into the landscape, by building it in an old lava flow. Planeta wines from Mount Etna will soon be produced in this wine cellar. The soils have a perfect exposure. Mount Etna’s volcanic soils originated from the slow erosion of the lava stone, ash, and organic matter, and are rich in minerals. The stones of the buildings, millstone and ancient terraces are black too. All around, the woods and more recent lava flows create a timeless atmosphere.